Recently, for no reason in particular, I’ve been obsessed with war. I don’t know why I have a desire to see violence or connect with a soldier’s turbulent and uncertain lifestyle; I neither condone nor seek to kill or injure my enemy, and while my life is in transition, the uncertainty is more about approximate life choices. Certainly not about life or death. Nevertheless, I find myself more and more identifying with a soldier and what it means to be one-track, one-day-at-a-time. 2009’s Best Picture winner, The Hurt Locker, bridges the gap between a warman and a civilian to a remarkably relatable T. Director Kathryn Bigelow inserts us, the readers, into the middle of the Iraqi conflict, but not as a demure bystander. We’re not confronted with the disaster story of a personal tragedy or a shaky upbringing that led to a damaged soldier with a death wish. Instead, our conflict exists extant the horrors and violence of war. The camera work and the haziness of what’s “right,” inserts each of us into the uncertainty of a bomb squad, whose task it is to defuse IEDs and uncover some of the layers of war not related to conflict or even guerrilla warfare. We’re concerned with this teams’ move on a minute to minute basis. Compelling tells half the story. 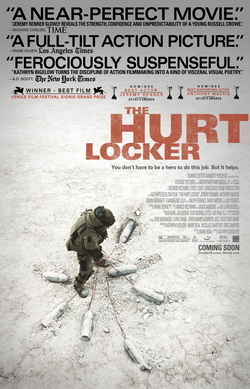 The phrase, “the hurt locker,” is an interesting one, as it’s relatively obtuse as a straightforward metaphor, but shockingly obvious if we peel back the layers. For me, a hurt locker is a place to store despair, hate, anger, annoyance – negativity; it’s an organizational tool through the lens of war. For our bizarrely autonomous team, the hurt locker is more literal (still figurative) – in a place where death is relevant and imminent the hurt locker is a function of a solider’s mind to quickly switch on and off the feelings to achieve a task. For our soldiers, who seem to operate without direct command, it is essential that the hurt locker exists to keep a clear head when lives are at stake. But what happens when lives aren’t at stake? as war correspondent Chris Hedges writes – not only serves as The Hurt Locker‘s epitaph, but also, as the film unfolds an eerie representation of Jeremy Renner’s character, Sergeant First Class William James. He takes the war personally and his hurt locker is perpetually running at full capacity. About 90% through the film, Bigelow cuts to SFC James staring at an inconspicuous wall of breakfast cereal and his face says it all: Coco Puffs are not an appropriate replacement for the drug of war. I’ve been obsessed with war and war film because for me, Coco Puffs might be a suitable replacement for the drug of war: I’ve never had either, so I have no idea. But that doesn’t stop me from visualizing and fantasizing about things that are literally and figuratively foreign to me. These concepts also help to explain why I enjoy hip-hop music and can identify with the Bauhaus art movement. Maybe there’s a small part of me that wants to go explore the danger of the unknown world of war and art, but as far a film goes, The Hurt Locker has earned a place in film lore as “important,” not because it’s a reflection of the Iraqi conflict, but because it successfully humanizes, for most of us, a blind conflict, about which we have too many opinions. The Hurt Locker is a perfect example to represent my overall thesis for The Academy Nominees Project. It represents the mood and the gestalt of the year 2009 more than any other film released that year. The conflict, eight years unfolding, had yielded very few tangible, public results and instead begged the question: why are we wasting our time, our money and our energy on a conflict that, for all intents and purposes, was without purpose? This question became a centerpiece among political discussion talk shows and played a huge role in the Presidential election of 2012. The Academy honored this zeitgeist defining moment with a Best Picture nod, especially in an expanded field of nine, instead of the established five, nominees. These five seem to pack a different punch when taken apart from the fluff: the $500 million Fern Gully remake, Sandra Bullock’s circle-jerk, the Nick Hornby bore, a Coen brothers rare miss and George Clooney.